Rightly understood and rightly communicated, the Christian faith is one of great joy. It is an invitation to God's kingdom, where tears are replaced by laughter and longing hearts find their purpose and their home. This is the heart of the gospel: God's search to reclaim us and love us as his own. But have we truly grasped this? Those of us who have disdained Christianity as a religion of bigotry?have we repudiated the genuine article or merely demonstrated our own prejudice and ignorance? Those of us who are Christians?have we deeply apprehended the mission of Jesus, and do our ways and character faithfully reflect his beauty? From the nature of God, to the human condition, to the work of Jesus, to God's coming kingdom, and all that lies between, how well do we understand the foundational truths of Christianity and their implications? 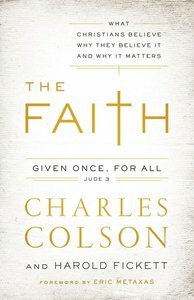 The Faith is a book for our troubled times and for decades to come, for Christians and non-Christians alike. It is the most important book Chuck Colson and Harold Fickett have ever written: a thought-provoking, soul-searching, and powerful manifesto of the great, historical central truths of Christianity that have sustained believers through the centuries. Brought to immediacy with vivid, true stories, here is what Christianity is really about and why it is a religion of hope, redemption, and beauty. Customer Reviews For "The Faith"
I had recently read about the life of Charles Colson. From his time as a hatchet man for Nixon to his transformation following his time in prison. I found the first part of this book powerful in defending Christianity and providing  some detail into the tenants of this faith. However, by midway into this book I began to feel uncomfortable as it became somewhat of a apologetic for Roman Catholicism. He attempts to unite Protestantism with Roman Catholicism with statements such as both sides being guilty of tradition (p. 150) and brushes over the fundamental differences that led to the reformation in the first place. Uniting opposing faiths just does not work as Christianity is exclusive. The "solas" still remain and oppose ritualism. Apart from this, the stories presented by Colson are fascinating and very well written, providing a great insight into the prison ministry.